Pangkor Island Malaysia - is it one of the "Best Places to Retire"?. Is This one of the Best Places to Retire. Is Pangkor Island Malaysia one of the Best Places to Retire? Pangkor Island, Pulau Pangkor in Malaysian (pulau means island) is a small island on the west coast of Malaysia, roughly 180 km north of Malaysia's capital Kuala Lumpur and 180 km south of Malaysia's most popular holiday destination Penang. It's a small island. To give you an idea of the size, the circle road around the island is only 18 km. 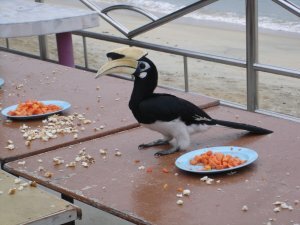 Therefore it's not difficult to understand Pangkor is not famous for a lot of attractions. But this doesn't mean Pangkor is a boring island. It is not at all. 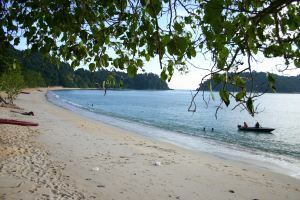 Pangkor IS famous for its tranquil beaches. But there is more. There are a few sights to visit. In principle you can separate the island in two pieces: the eastern part, where you arrive is what I call the industrial zone with fishing villages. The western part of the island is the part wit the beaches, hotels and restaurants, the tourist part. The fishing villages are fascinating. Although fishermen go out with their trailers much is still the same as it was in the past. You can visit some ikan bilis (anchovies) shops where in the back the catch of the day is still drying in the afternoon sun as it has been over the centuries. And after drying it's sorted out by hand by the dozens of workers. Or visit the boat building wharfs! Food in the villages is based on fish, of course. The fishermen sell their catch at the markets but leave some for themselves or relatives to serve in the small restaurants. You can't get it fresher than this. Nearby you will find the Foo Lin Kong Temple and the remains of the Dutch Fort, a centuries old fortress strategically build on the south east part of the island to control the route in between Pangkor and the mainland. One of the reasons I like the island a lot is the possibility for hiking. Despite its small size, there are a couple of excellent and not too difficult routes to walk. One goes roughly from the Dutch Fort to Pasir Bogak and is partly even paved. This is an excellent moment to explore the local flora and fauna with hornbills and a variety of orchids. The second hike is more challenging. 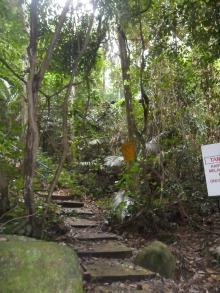 It starts at the far north part of Pangkor and cuts through the hill through steep (and sometimes muddy) paths all the way to the western part of the island. Boots and long trousers are necessary here as you will experience plenty of leeches. 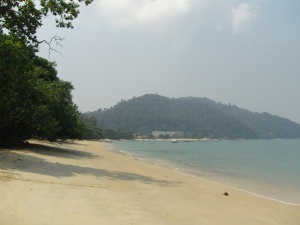 The beaches are all located at the west part of Pangkor. It's the prime reason people visit. The two most famous beaches are Pasir Bogak and Teluk Nipah. Pasir Bogak is a long stretch of sand with hotels along the stretch (although only a few are actually build right on the beach). In the middle of Pasir Bogak you find restaurants and souvenir shopping plus a few small convenient stores. More interesting is Teluk Nipah. Basically Teluk Nipah is a hotel/guesthouse village. This in itself is not the most interesting part but it's the nearby (5 minutes walk) Coral Bay Beach which is the real attraction. This beach, an extension of Teluk Nipah has the shape of a bay, In front there is a small uninhabited island Pulau Giam . It has always beautiful clear and quiet waters, a real asset to people who come here with children. There is one more beach worth to mention but it's a private beach. Teluk Belanda is part of Pangkor Island Beach Resort. This beach too is a bay, with shallow waters and surrounded by lush jungle. But it's not open for visitors who do not stay in the hotel. Further there is Pangkor Laut, the little island west of Pulau Pangkor. It's a luxuxry 5 star island hotel and not available for visitors other than those who stay at Pangkor Laut. The most famous beach here is Emerald Bay where you can, if you're lucky even feed black tip sharks. For visitors to Malaysia who fly into Kuala Lumpur I usually advice to skip KL and come directly to Pangkor to acclimatize, get used to weather, food and money before traveling further into Malaysia. On the way back home you can visit Kuala Lumpur anyway. Pangkor is connected to the mainland by ferry from Lumut. Here you can get buses to all major tourist destinations in Malaysia including Kuala Lumpur, Penang, Kota Bharu, Malacca, Perhentian, Johor (Singapore) and even Kuantan. There is a 6 times a day bus from the airport to Sitiawan, 10 km from Lumut, from where you have to take a taxi to Lumut. This is by far the fastest and cheapest way to travel from the airport to Pangkor. Many thanks to Peter VanDerLans of www.pulau-pangkor.com for supplying the above firsthand information and photos! Curious about the 10 Best Places to Retire? So was I - so I did some research. You can see the results here. Sometimes, it's useful to work out a personally meaningful Retire Abroad Checklist as you consider not just where to Retire, but whether Retiring Abroad is the right thing for you!